Listen to "Murder with a Twist" on your iOS and Android device. The regulars at Mack's Bar love putting their heads together to solve a good mystery. But Mack is learning there's a big difference between barroom brain teasers and real-life murder . . .
Milwaukee bar owner Mackenzie 'Mack' Dalton has a unique neurological condition that gives her extra perceptive senses, and police detective Duncan Albright is convinced Mack's abilities can be used to help catch crooks. 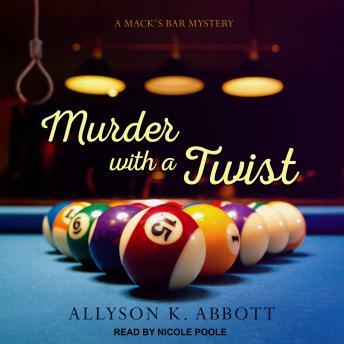 Mack may be at pro at mixing drinks, but she's still an amateur when it comes to solving crimes-and she's not sure she should mix business with pleasure by working with a man who stirs up such strong feelings in her. At her first crime scene-a suspicious suicide-she experiences a heady cocktail of mixed sensations and emotions that make her question whether police work is right for her. But when Duncan asks her to help find a kidnapped child, she knows she has to give it a shot . . .
Love this series. Fun to listen too. Makes me feel like I know these characters.